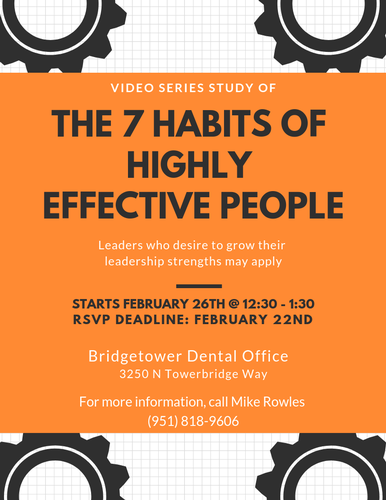 Video Series Study of "The 7 Habits of Highly Effective People"
Name: Video Series Study of "The 7 Habits of Highly Effective People"
You are invited to participate in a video series on “The 7 Habits of Highly Effective People.” It will be hosted by Chamber members Dr. Tom Cox, Bridgetower Dental, and Mike Rowles, LIFE Leadership. Leaders who desire to grow their leadership strengths may apply. The study of “7 Habits” will be stimulating, thought provoking, and life valuable. Bridgetower Dental Office, 3250 North Towerbridge Way, Meridian or alternate location (tba). Participation time (2 hours/month) and purchase of 7 Habits book - if you don’t already have a copy.